Stop social dumping and unfair competition! Protect the safety of all road users! Meet drivers and visit their trucks. 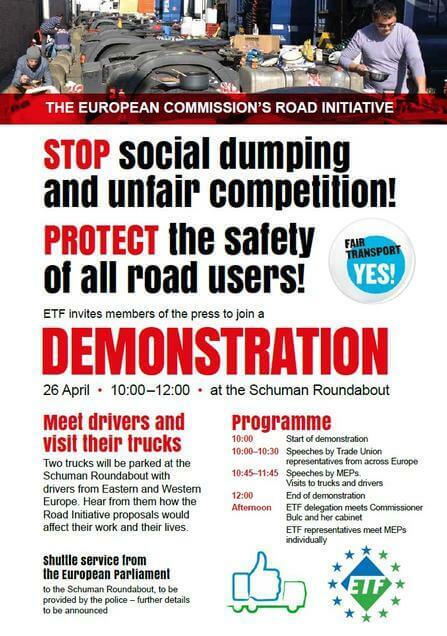 Two trucks will be parked at the Schuman Roundabout with drivers from Eastern and Western Europe. Hear from them how the Road Initiative proposals would affect their work and their lives. Shuttle service from the European Parliament to the Schuman Roundabout, to be provided by the police – further details to be announced.